I am delighted to be taking part in, and indeed closing down, the Blog Tour for Mike Thomas’ #Unforgivable and thank you to Mike and Bonnierzaffre for the ARC and inviting me to take part! Let’s get the show on the road! #KillerHook Alert! What a killer hook of a start! With the description of the market in full flow – could almost hear, see and smell the riot of colours, tastes and vibrancy before #BANG it exploded into one of the most explosive starts ever! I can tell you it did not let up at all right until the very last page! DC Will MacReady and the team are thrown into the midst of what appears to be racially motivated attacks in Cardiff City Centre. While Will wants to be in the thick of the investigation his superiors sideline him to investigate the attack on a young girl around the same time of the bombings. Tensions are running high across the force and it is soon clear that the team might be entering a race against time that they just do not have! I was slightly hesitant to start when reading the book, I hadn’t read the first in the series and I definitely did miss out on a bit of the back story as to why MacReady was in disgrace and just how complex his personal life really was. However, enough information was given to ensure that I could still follow the plot and not feel like I was missing out. A slow-burner but worth staying with it…. I really wanted to like this book. It’s written by someone who has first-hand experience of front-line police work and is based in Cardiff and Penarth; places I know well from the 50s and 60s. My heart began to sink though after the first couple of chapters as I couldn’t relate to either the main character or indeed the constant reminders by the author of the effects which budget cuts have had on police numbers and effectiveness. Things looked up quite quickly though and when they did it was quite a journey. DC Will MacReady has returned to active duty after being involved in an incident which led to the death of one officer and the serious wounding of another. Many are unwilling to welcome him back and feelings run high in the team although he does have the support of his Inspector and Sergeant. All this becomes secondary though when a bomb explodes in an ethnic market, shortly followed by another at a mosque in Penarth. 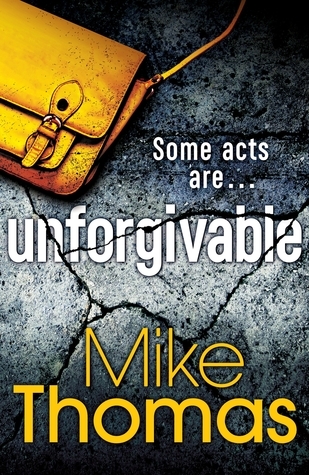 Unforgivable Mike Thomas – Blog tour Interview and Review. So let’s talk about Will MacReady. This is his second outing and you are no nicer to him this time than you were last time. Mean you crime writers are (that is my attempt at a bit of Yoda) So readers coming in have a bit of background – what was the inspiration behind Will and tell us a little bit about his journey before the beginning of Unforgivable. Impressive Yoda, there. * channels Darth Vader* Most impressive. Where were we? Oh yes. Well first, the name – one of my fave horror films is John Carpenter’s ‘The Thing’, with Kurt Russell’s protagonist MacReady. I always wanted to use the name as a nod to the movie. And I’ve had the MacReady character in my head since the 90s, when TFI Friday used to be on the gogglebox and Chris Evans’ producer sidekick was called Will – remember when they all used to point at him and say ‘Wiiiiiiiiiiillllllll’? That’s how Will MacReady was named. How daft is that? Anyway, MacReady is basically me when I joined the job: a tad naïve, wants to make the world better, is slightly gung-ho but his heart is in the right place. Give him a few years he’ll be cynical, overweight, have a completely shaved noggin and an addiction to XL kebabs (with coleslaw) while working night shifts – again, just like me….